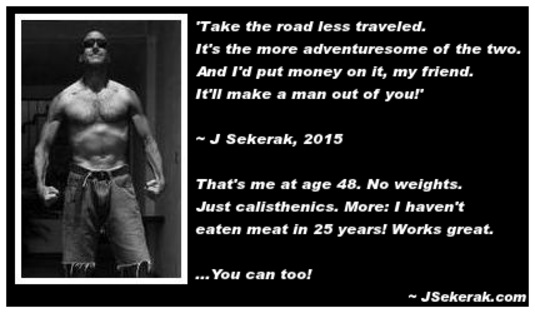 Yes, calisthenic workouts burn body-fat, build muscle, and develop great mental toughness - all in a single session. They draw deeply from your reserves, the longer you do them. They build speed and 'explosiveness' on the athletic field. They release natural opiates from the brain, and human growth hormone from the pituitary gland. They even cause you to sleep well, and wake up invigorated. For example: I did a workout this morning of 700 squats, push-ups, and crunches - all done in about 45 minutes. Toward the end of the routine, as I pushed myself to muscular and cardiovascular 'failure,' I imagined this: My physical self, as strong and permanent as the concrete floor on which I exercised. As I did my final set of push-ups, I literally pictured my arms, legs, and core as being made of solid, permanent, immovable stone. I imagined the material coming up through the floor. I imagined it entering through my hands and feet - and then becoming one with my flesh. I thought of this happening, NOT in a negative way, but in one that seemed to transfer the permanence and strength of that solid floor, into my body. And: As I held that picture in my mind? I was able to push myself with such force, belief, and internal power during my last few repetitions. That I just may have completed one of my best workouts ever. Look around yourself, before beginning your next exercise session. Pick out an object that represents, in your mind, something more radiant, powerful, or permanent than yourself. It could be a tree, a stone, even the sun - anything that, just by looking at it, inspires a deep feeling of 'awe,' in you. Now, as you're doing sets of squats, push-ups, pull-ups, crunches and the like, imagine your body is made of the same 'stuff' that makes up the object you've chosen. During squats, imagine your legs immovable as a tree of oak. During push-ups, imagine your arms as strong as steel cables. During crunches, imagine your core as solid as a pillar of concrete. I believe there is a deep truth in using this technique - a truth that's not visible to the naked eye. In fact, we now know that there is very little that separates us from all we see around us. The only reason a rock feels more solid than my body, is that the atoms from which it is made are vibrating at a different speed than my own. So is it unfathomable for me to imagine I'm made of, as great author W. Wattles (The Science of Getting Rich) once said, the same 'thinking stuff' that makes up the rest of the universe? Is it inconceivable for me to view myself as powerful as that upon which I focus my attention? Even something as solid as a tree or a pillar of stone? Imagine yourself as that which is solid, permanent and unbreakable. Picture yourself as bright and beautiful as the sun! View your body as made of concrete and steel. Imagine yourself as powerful and strong as an oak. Do this during your workout. Push yourself to the limits of your physical ability! And your vision may become physical truth.